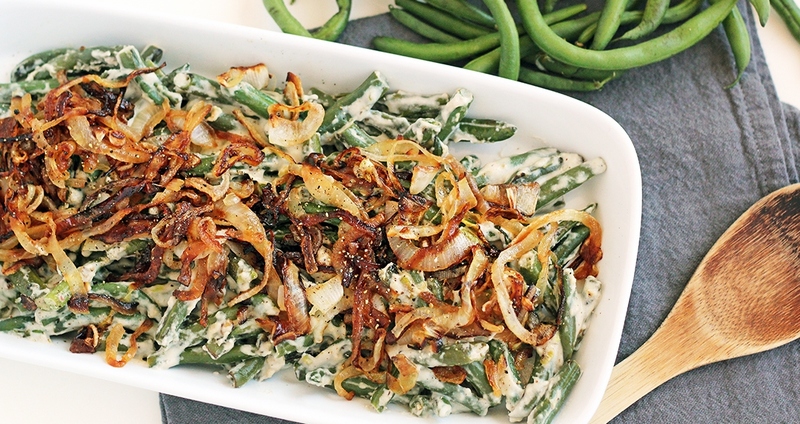 This green-bean casserole is a healthier remake of the classic holiday dish, which uses a rich cashew milk in place of the canned soup. It’s a recipe that can be made entirely on the stovetop, leaving your oven free for other baking! Add one tablespoon of coconut oil to a medium pan over low-medium heat. Add the onion and sauté for about 20 minutes, stirring occasionally, until onions are caramelized and browned. While onions are caramelizing, add the remaining tablespoon of coconut oil to a large saucepan over medium heat. Add the green beans and cook for 10 minutes, or until beans are bright green and just tender. Add the cashews, broth, garlic powder, salt and pepper to a blender and blend until smooth. Add the blended cashew milk to the green beans, cover, and lower heat to a simmer. Allow to simmer for 10 minutes or until the cashew cream has thickened and green beans are tender. Transfer to a dish for serving and top with the onions. Serve warm.